Considering applying for low-cost, long-term financing? 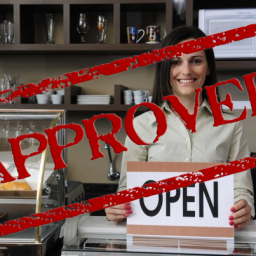 An SBA loan through SmartBiz can be the right choice for your business. A strong business credit score will help demonstrate your ability to repay the loan and is one of the most important factors lenders consider when you apply for funding. Learn more about how to build your business credit so you can achieve the financial goals of your business.’re open for business, make sure that your company is listed and registered in official directories. This includes your business’s legal name, address, and phone number. Opening a bank account dedicated specifically to your business expenses will also help keep your transactions separate. Maintaining strong relationships with suppliers, vendors, and other retailers is one of the most reliable ways to build credit especially as you’re starting to build it up. Rather than paying the amount you owe upfront, creating trade-lines will let you spread out the payments. Fully repaying these charges on time will let you develop your business credit if the suppliers report to credit bureaus. This will probably sound familiar if you’ve ever dealt with personal credit because the process is very similar. An Employer Identification Number (EIN), also called a Federal Tax Identification Number, is a unique number that’s used by the IRS and mostly shows up on tax forms. Even if you don’t have any employees, meaning you’re a sole proprietor or a partner, it can still be helpful to get an EIN so that when you do apply for credit, it can replace your own social security number. That way, you won’t be affecting your personal credit score if you incur any costs. Another number you should consider applying for is the Data Universal Number System (DUNS) number. The DUNS isn’t managed by the government. Instead, a major credit reporting agency, Dun & Bradstreet, is in charge of distributing these identification numbers. They can help forecast the financial stability of your business, so they can be useful both to you and to lenders. Some financing options that will help you grow your business and build its credit are business credit cards, term loans, and lines of credit. Using your funds carefully, paying back on time (if not early), and not having outstanding balances are crucial to reach a higher business credit score. Don’t allow any issue to have a negative impact, so stay on track and be consistent. Before taking out any kind of credit, be sure that you understand exactly how much you’ll be expected to repay and how often you’ll be charged. It can be difficult to meet the eligibility requirements for more affordable financing if you’re in your first few years of operation. In that case, you might want to consider getting a secured credit card, where your spending limit is set by your own deposit. Using funds through secured business credit cards can help you get a head start and be on your way to low-cost, long-term funding like an SBA loan through SmartBiz. To show proof that you’re being responsible when it comes to business credit, work with lenders that will report your payment history to credit bureaus. That way, you’ll be getting the official recognition you need to prove that you can be a trusted borrower and qualify for loan options with the best terms and lowest rates. Most banks and financial institutions report information about their borrowers’ payments to all three major credit bureaus, but some alternative lenders don’t. Be aware of these kinds of policies, and don’t hesitate to ask questions before you apply so that you find out before it’s too late. 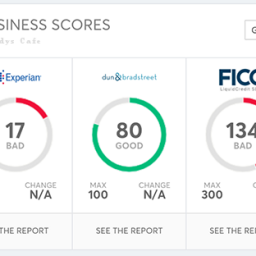 Each major credit bureau, like Dun & Bradstreet, Equifax, or Experian, has its own reporting system that lenders can use to pull your business credit score. This means that it’s up to you to maintain your information everywhere your business is listed. Be as descriptive as possible on your profile so that those who view it don’t have any major questions or concerns when they’re learning more about your business. For more tips on strengthening your business credit score, visit our Small Business Blog: Do You Know Your SBSS FICO Business Credit Score? Learn more about your business credit score and how lenders assess this and other key criteria in your SBA loan application by trying SmartBiz Advisor™! This free, online educational tool immediately generates your unique “Loan Ready Score™” based on the key criteria banks consider when evaluating a business for funding. Get started here.